Hydrogen has been dubbed ‘the fuel of the future’ but thanks to our scientists, that future could be much sooner than we think. We’ve created a metal membrane that filters out pure hydrogen gas from ammonia. It can then be dispensed into fuel cell cars, buses and even trucks. And the technology isn’t just fantasy, we recently powered fuel cell electric vehicles using locally-produced ultra-high purity hydrogen. And now the technology is being commercialised via a partnership with Fortescue Metals Group Ltd. The investment in our hydrogen membrane technology will help steer us towards a domestic hydrogen industry, with the potential for future global uptake. It’s highly abundant in the atmosphere. It’s clean – when burnt it gives off water instead of carbon dioxide. It’s highly adaptable – it can be burnt like petrol or produce electricity in a portable fuel cell like a battery. It can also be generated using many different methods, for instance, the generation of electricity using renewable sources like solar. Did we mention it’s clean?! The hydrogen molecule is made up of two protons and two electrons. When burnt, the bond between the electrons is broken and energy is released. This energy can be used to power a vehicle. When used in a fuel cell, a chemical reaction between the hydrogen molecule and oxygen creates an electrical current. There are some challenges though. For instance, its low density makes the gas bulky and difficult to transport and store. You might not know this, but we’ve been here before. For centuries we knew about the existence and potential of natural gas as a fuel source, but without the ability to store and transport natural gas safely and efficiently, it was an impractical fuel option. By the 1900s, scientists had worked out how to liquefy natural gas (LNG) but it was sometime later that it could be stored in tanks, exported, regasified and used on a commercial scale. Fast forward to this year and Australia is projected to become the world’s largest LNG exporter, and our LNG production is expected to hit 10 per cent of the global crude production by 2020. Hydrogen is following a strangely similar path. We know hydrogen has huge potential as a fuel. We even know it could be easily transported and stored in the form of ammonia (NH3). But, until now, the challenge remained: how can we extract pure hydrogen at the point of need – for example, at a fuelling station? Enter: our hydrogen membrane technology. Hydrogen can be extracted from ammonia, first by using a catalyst to help decompose the ammonia molecule into a mixture of nitrogen and hydrogen gas. Then, the hydrogen membrane allows hydrogen to pass through it while blocking any other gas. Australia’s energy needs are changing, and momentum on hydrogen is growing both nationally and internationally. 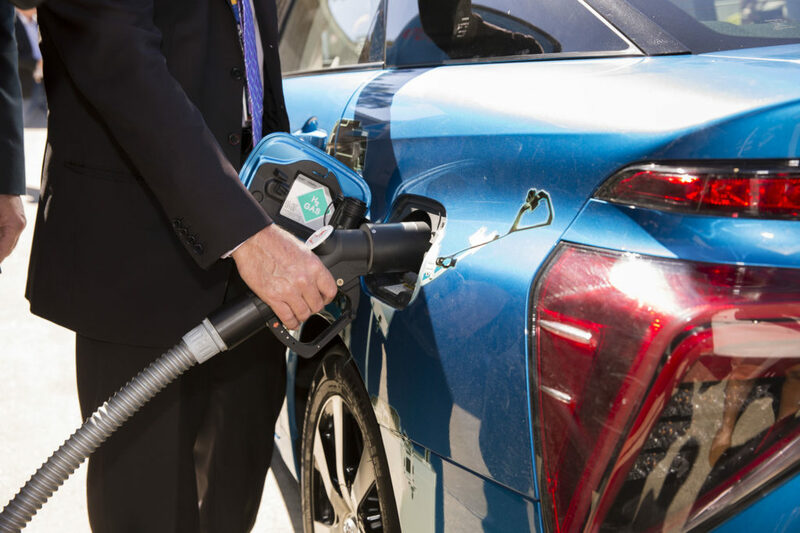 The hydrogen council predicts that by 2050, hydrogen will make up 15 per cent of global energy demand, with annual sales of hydrogen and equipment of $2.5 trillion! Our work on alternative fuel options is proving critical in preparing for a reliable, economical and sustainable energy future. There is now the very real potential for a national renewable hydrogen export industry, and a growing global market for clean hydrogen. With this world-first membrane technology, hydrogen now has the potential to rival the LNG industry. Working with Fortescue Metals Group Ltd further hydrogen R&D technologies we hope to build new Australian industries and support opportunities for low emissions exports. SO you are running the on-board GH2 at extremely high pressure to be able to get the mass; what pressure does the fuelcell need? Could one miniaturise the catalytic converter and carry Liquid NH3 instead. At that pressure hydrogen leaks are self-igniting. Exiting technology – not sure about the headline though, currently Ammonia is produced industrially from natural gas (methane) which is the cheapest source of Hydrogen. It is unfortunately not renewable and certainly isn’t carbon free! You’re right in saying that currently, hydrogen and ammonia are chiefly produced using natural gas reforming. But as renewables become more commonplace, we’re working on changing that. With Australia’s vast solar potential, there’s no reason why we couldn’t see a massive swing towards renewable production in the very near future. We can also work to make the natural gas reforming process cleaner by sequestering the associated CO2 emissions. There is a project to do this in the Latrobe Valley, Victoria. Blast! now I have lost my whole comment because I went to the “a few guidelines” to check why you require a website url as part of my details. Even though I put in my work website it still asks for a url. What’s the go? We don’t require a website URL for comments. Everything seems to be working from our end, but we’ve only received the above comment from you. Perhaps try again and hopefully it will work this time! Great Idea, but I thought the difficulty still exists with respect to the safety of hydrogen fuel storage on passenger vehicles. Is not the explosion which occurs when subject to let’s say a fire as a result of a MVA, akin to a bomb going off?